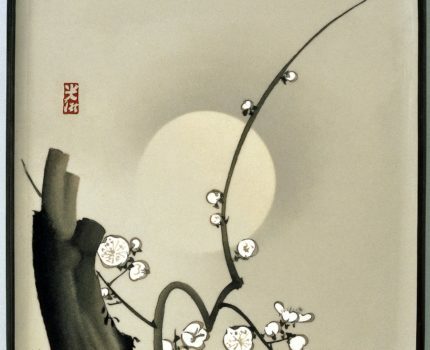 From the 1860s through to the 1890s the rise of Japonisme and the Art Nouveau movement meant few could resist the obsession with all things Japanese. Superbly and artistically crafted and often highly decorated Japanese objects – lacquer, metalwork, ceramics, enamels and other decorative items rich in new and exotic subject matter – stimulated and inspired Western artists and craftsmen to produce their own works. Arts of the Meiji period (1868–1912) were displayed at international exhibitions, in the galleries of influential dealers and at fashionable stores in London, Paris and Vienna. The imagery, decorative themes and artistic styles to be found on these objects are also apparent in the work of painters such as Vincent van Gogh, who personally had strong links with Siegfried Bing, perhaps the most prominent and influential Paris-based dealer in Japanese art in the late nineteenth century. Van Gogh himself had stated that he owed his inspiration to Japanese art but he was probably not conscious of the full extent to which art in Europe had already been influenced by that of Japan. Nasser D. Khalili has formed the world’s greatest collection of Meiji decorative art, comprising over one thousand pieces and including works by most of the known masters from the middle of the nineteenth century to the early twentieth century. The collection has demonstrated the unrivalled virtuosity of these remarkable works of art and has facilitated new studies of their genesis and progression. In addition to the collection of Japanese Meiji period arts, the Khalili Collections comprise Three Hundred Years of Japanese Kimono (1700–2000), the Arts of the Islamic World (700–2000), Swedish Textiles (1700–1900), Spanish Damascened Metalwork (1850–1900), Enamels of the World (1700–2000), Aramaic and Bactrian documents (400 bc –ad 700), and Hajj and the Arts of Pilgrimage (800–2000). Together the eight collections comprise some 25,000 works and are fully catalogued in an ongoing series of over 88 books, out of which 70 have already been published. The collections have been shown in over 40 major museums worldwide. Furthermore The Khalili Collections have been major contributors to more than 50 international exhibitions.